Although the TS8 had nominally been superseded by the TS11 in October 1939, the exigencies of war resulted in deliveries of the earlier version continuing well into 1940, when Wilts & Dorset received fleet number 186, CHR 485. The TS11 model became quite a rare beast from its eventual appearance in mid 1940, and when Leyland turned its entire resources over to war work, the final 22 TS11 chassis emerged as a result of the “unfrozen” programme in 1942. They were the very last TS type Tigers to be produced. The photo in the above link of CHR 485 in Wilts and Dorset ownership is interesting in that the glasses of the destination indicator and those of the fixed passenger windows below the opening sections have flush rubber glazing, which must surely have been a later modification to the 1940 vintage Harrington body. The same features are evident in its later guise as a caravan. I can find no current record of CHR 485 being in existence today. Sad that despite having survived till 1970 this superb Tiger is no longer around. Let’s hope that it’s sitting somewhere awaiting restoration, though I feel that that’s unlikely. Sorry, the 1993 Slater/Godwin preserved buses list has it as "chassis only" with the South Lancashire Transport Society in 1986. How come that W&D, I presume a Tilling company, ordered Leyland chassis and not Bristol ones? In pre-war days, W&D had close links with Southdown, and followed it’s purchasing policies rather than Tilling ones. Indeed, at the outbreak of war, a fair number of Southdown Leyland TD1s found their way to W&D because of the need to cover wartime service personnel services in their area [Salisbury Plain]. The 1942 split of T&BAT arrangements left W&D in the Tilling camp rather than BET. The reason why is surely that this was before nationalisation, and I recall reading somewhere that before WWII Wilts & Dorset was heavily influenced by Southdown – a Leyland fan. Thx for that, Michael/David. For some reason, most Tilling group company bus photos I’ve seen have always been Bristols, hence my query. My experiences with Bristol buses has been very limited and greatly influenced, negatively, by the pre-war Bristol K’s on the Isle of Wight, noisy, vibrating things, which made me think that Wilts & Dorset were very wise in buying Leyland vehicles in preference! My other was riding in more civilised post-war Bristol K’s from Fareham Bus Station to Warsash when, living in Southsea, I was posted, for some bizarre reason, to RAF Calshot for a my last 6 weeks National Service! There were actually quite a few BTC companies that used Leylands – Cumberland, Lincolnshire, Western and Southern National – and even Bristol Tramways & Carriage Company itself! The Slater/Goodwin book told a partially correct story. 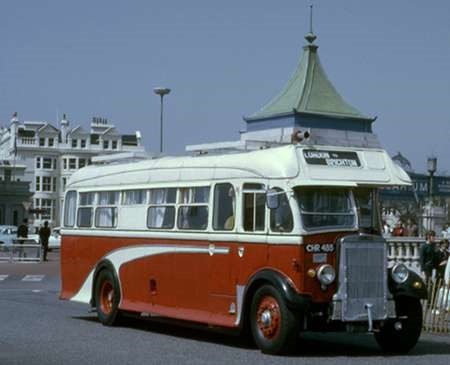 The chassis of CHR 485 came to the South Lancashire Transport Society from the well known Bolton PSV dealer – Lister’s. It was acquired as a donor vehicle to aid the restoration of Ribble Tiger 209 (1400), RN 7588. Upon completion of RN, the chassis of CHR was stripped for anything useable and scrapped locally. United also had many Leylands, especially fir their London coach services.